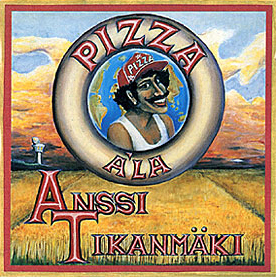 "Pizza" was made and released at a time when the whole of the Western world was in the grips of a recession. But the deeper Finland and the rest of the world sank into the depression, the more splendid the Pizza became. By the end, making the Pizza involved no fewer than 69 musicians, 39 different instruments and a whole 38 studio days, to say nothing of all the days' work for the three preceding years during which the dough was kneaded, the toppings chosen, the Pizzas baked and the table set. to put a stop to the overall air of gloom and doom. The moment was ripe for the Finnish musician to tighten his belt, prove his mettle and his unshakable faith in the future. Time for the boys and girls to come out and play and eat pizza alongside the old gig hands in the face of the global midi-storm of material warfare! Help yourself to a slice of Pizza! All lyrics by Anssi Tikanmäki, except “Cowabunga Kidz” by Jaakko Teppo & AnssiTikanmäki. accordion, Tomas Jimeno Diaz, percussion, Markku Niiranen, guitar, Raimo Ollikainen, violin, Pia Palomäki, vocal, Sakari Kuosmanen, vocal, Lennart Koskinen, violin, Matti Lappalainen, trombone, Häkä Virtanen, bass, Jari Yliaho, vocal & guitar, Erkki Hiltunen, violin, Ila Loueranta, vocal, Juuso Nordlund, bass, engineer, Seppo Ristolainen, viola, Timo Salmi, bass, Esa Tukia, horn, Petri Rantala, percussion, Timo Paasonen, trumpett, Hanna Kaarina Heikinheimo, piccolo & flute, Vesa Sytelä, harp, Atso Almila, conductor, Hanni Heinonen, violoncello, Tom Bildo, trombone & tuba, Tapio Laivaara, flute, Kari Vanonen, violin, Jaakko Vuornos, violin, Mikko-Ville Luolajan-Mikkola, violin, Hannu Pajuoja, horn, Pepa Päivinen, ten & bar sax, flute, clarinet, Pekka Pulakka, viola, Siri Heinonen- Nevala, violin, Toni Lähteenmäki, vocal, Jouni Heinonen, violin, Pentti Lahti, alto & baryt sax, flute, Anssi Nykänen, drums & perc, Lauri Laasonen, viola, Janne Murto, ten sax, Päivi Kiljala, clarinet, Jaakko Teppo, vocal, Jukka Hänninen, accordion, Tapio Lehtonen, bassoon,Timo Alanen, violoncello, Petri Juutilainen, trombone, Juha Sippu, piano, Aki Välimäki, trumpett, piccolo tp, Anssi Lahti, bass, Heikki Silvennoinen, vocal.